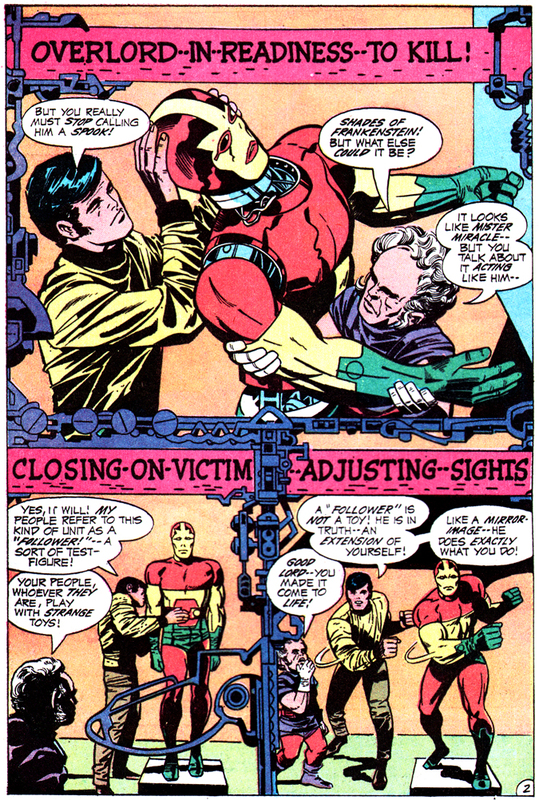 Posted 2 January 2011 in Apokolips, Locations, Mister Miracle #2, Weapons & Devices. 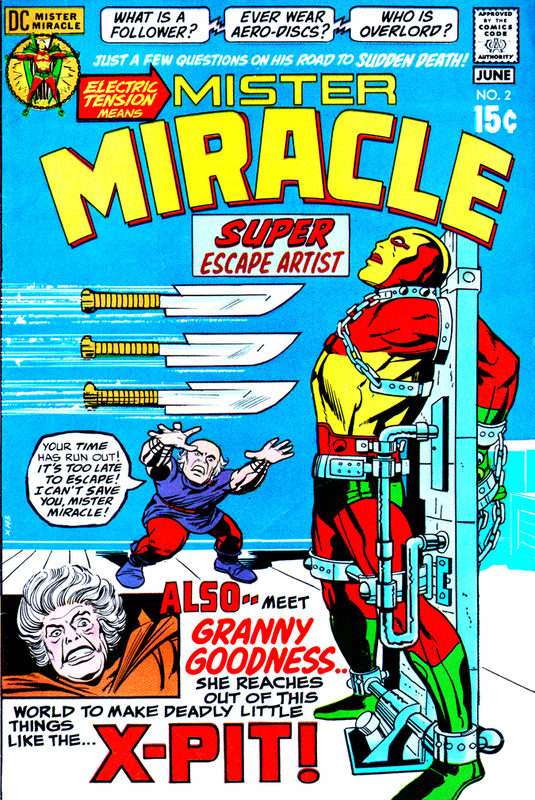 Granny threatens her underlings: retrieve Mister Miracle or else… “But we know where he is now, don’t we?” screams the old battle-ax. “Get him! Get Scott Free! Bring him to Granny! — Or take his place in the X-Pit!” The minions kidnap Oberon and what they think is Scott Free (it’s just a Follower) and deliver to Granny, and when the real Mister Miracle comes by to rescue his assistant, Granny springs the trap. “I’m here, Granny! But I can’t stay long! Just to pick up a friend!” Granny demurs, “You’ll stay! You’ll stay for eternity! Open the X-Pit, Overlord!” She then pushes a button and Scott and Oberon plunge into the X-Pit! There is an ominous humming sound! — An eerie flash — as invisible forces rush from a widening gap in the floor!! Granny: Ha ha ha ha ha –! I’ve got you, Mister Miracle! Scott Free: My Aero-Discs have been neutralized! I’m falling! It is a long fall, because the pit is deep! But the mad downward flight of its trapped victims is slowed as they near the bottom! Scott Free: Don’t panic, Oberon! We won’t be crushed! The hidden force-poles are reversing from attraction to repelling! At the bottom of the X-Pit is a transparent cage of unknown substance! Its doors close on its hapless prey as they drift within its confines!!! Scott Free: We’re still alive, Oberon! But prisoners of Granny! And, believe me — this is no ordinary prison! Oberon: That shouldn’t stop you, Scott! 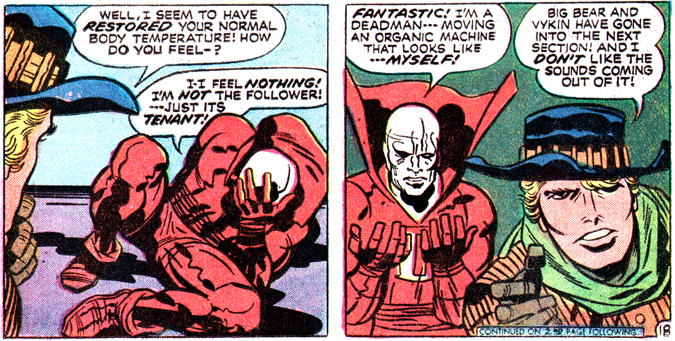 Not you — Mister Miracle! There appear to be 15 tiny buttons — five rows of three — in the transparent container and Scott pushes one. Oberon: You pressed one of those buttons — and, now, we’re frying! Scott Free: Hang on, Oberon! I know this for what it is — a Torment-Circuit! Made by the creator of this pit for Granny’s pleasure! [Pushes another button] Steel yourself, Oberon! This is the Electro-Shock Cycle! Oberon: I feel like I’ve swallowed a thousand hot needles! Pressing yet another stud, Scott and Oberon are suddenly engulfed in muck. Scott Free: I must continue the cycle! I must press another of the studs! Oberon: Do it! No matter what happens next — It’ll be better than this! Whew! This is a welcome break! But I don’t suppose Granny rigged this to last too long! Scott Free: No! Look about you, Oberon! Look at the quickly-rising mud! Oberon: Scott! Do something! Before this mud covers us! Scott Free: It will smother you first! This way, friend! Using his right hand, Scott lifts Oberon above his head, keeping him out of the rising mud. Oberon: It won’t help, Scott! Try to press the next cycle! Scott Free: Then the mud was gone — as if it had never been there — because Overlord was transforming its atoms into another form of torment! Granny: You killed Overlord! You had him killed by a damnable Mother Box! Scott Free: I earned many things when I left your institution — like these Aero-Discs — on which Oberon and I rose from that now useless pit! And so the demise of Overlord’s malevolent trap, the ex-X-Pit! Posted 31 December 2010 in Apokolips, Day Entries, Mister Miracle #2, Villains. 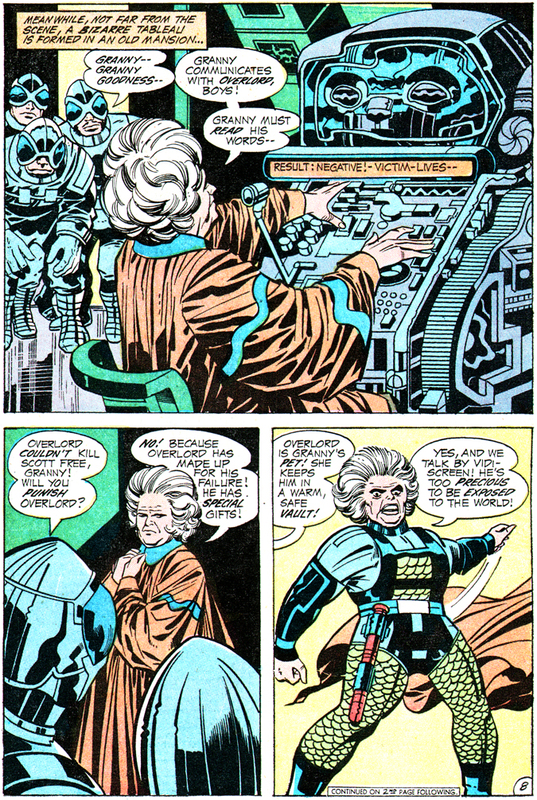 The first glimpse we get of the powerful Apokolips personality Granny Goodness is when she is sitting before a vidi-screen console communicating with her beloved Overlord, which is reporting its failed assassination of Scott Free, a.k.a. Mister Miracle. After beating her “pouting, jealous soldier boys,” we learn Overlord has created the X-Pit to eliminate Mister Miracle for his matron. Speaking in the third person, Granny explains to her guards, “She has lost her patience with rebellious boys! Granny Goodness wants to kill Scott Free! He was the first to run away from her institution!” She orders that he be captured and brought before her. Her peons seize a Follower, thinking it is the actual escape artist, along with the “sawed-off” assistant, and the real Scott Free suits up and puts on his Aero-Discs to rescue Oberon. Granny greets the kidnappers, telling them, “My soldier boys never fail their Granny! My soldier boys are the best!” Denying her sycophantic servants the right to watch her punish Scott and, in response to a bowed soldier telling her, “We love you, Granny! We serve you!” she indicates a bust of the Master of the Holocaust and orders, “Love him! Serve great Darkseid! Wear your pointed helmets proudly where he leads! die for him — and reward Granny!” But the gray-haired villain recognizes the prize is a phony and suddenly the real thing flies in to rescue an acquaintance. “I’m here, Granny! But I can’t stay long! Just to pick up a friend!” But Granny retorts, as she pushes buttons on the Overlord control panel, “You’ll stay! You’ll stay for eternity!” and she traps Mister Miracle and Oberon in the X-Pit. Scott Free: I’ve got to think! I’ve got to remember all I know about Granny Goodness! Oberon: Under other conditions, I’d be glad to forget about her! Scott Free: Beneath her iron facade lies a hidden fear! I’ve seen it! Oberon: She’s no youngster! Perhaps it’s just the simple fear of old age — and its insecurities! Scott Free: Yes! She’ll sacrifice anyone and anything — for gifts — rewards! 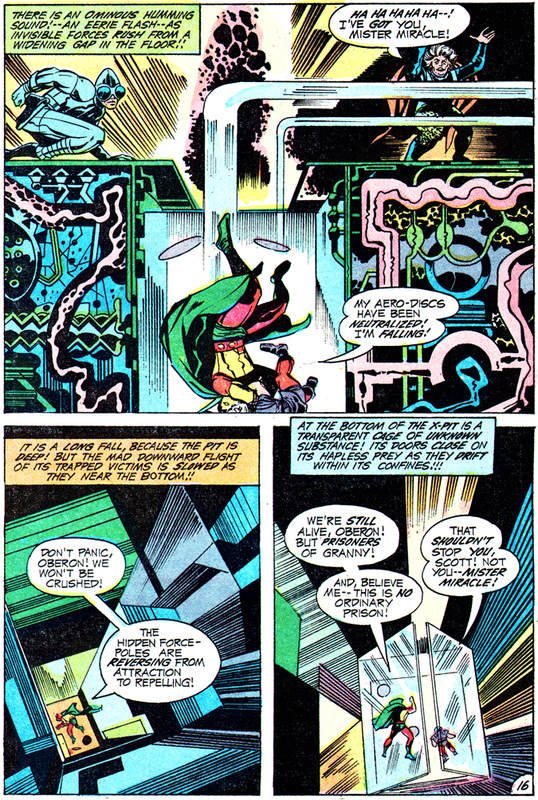 And, put a plan into action “on that premise” Mister Miracle tackles the lethal puzzle before him and his friend. Meanwhile, on her rocking chair and sniffling into her hanky, Granny is weeping crocodile tears. “Poor Scott Free! How he must be suffering! It’s too bad he couldn’tlearn to see things Granny’s way!” Her attendant tells her, “don’t weep over that coward, Granny! You must need comfort…” Caressing the cheek of the servant, Granny says, “My soldier boys are so understanding! That’s why Granny trains soldier boys!” Her boy responds with a grin, “Granny helped me earn my pointed helmet!” Turning to the Overlord container delivered before her, she says, “Granny has earned her rewards too! She’s worked hard! Done all the right things! That’s why great Darkseid gave her this wonderful gift!” A present which promptly explodes before her. “My guards — struck down! Attacked –!! No! No!” Standing before her is Scott Free and Oberon. Granny Goodness: Scott Free! Only a miracle could have gotten you out of the X-Pit! Scott Free: Not a miracle, Granny! — A memory!! The memory of a gift you once received! A gift for your old age — A gift named Overlord! — the gift that creates and destroys! Oberon: What is it like — where you come from, Scott–? You said it was a sort of orphanage — run by this old harpy — Granny Goodness!! Scott Free: You saw her, Oberon… I’m certain you found her quite impressive! Well, she’s in charge of one of many institutions where the young of Apokolips are raised and trained to develop their inherent powers!! Oberon: I’ve seen some of those powers, too! It can shake a man to his bones!! Scott Free: You’d find the orphanage a nightmarish place!! Barda and I were raised there! When I’d had enough, it was she who helped me escape! I suppose that’s what I’ve been doing ever since!! During the opening of “The Apokolips Trap,” one of the transport attendants tells the Harassers, “Lick your chops, you land-rats! These new orphans for the Granny Goodness Finishing School are a shaking mass of gooseflesh. As the handlers beat the tar out of the young and fearful new arrivals, Granny shows up with her huge mastiffs and beckons to Hoogin, one of the “brutal, relentless, and efficient” Harassers. “I have a rough one here, Granny Goodness! !” says Hoogin. “He shows signs of becoming a trouble maker! !” Granny interrupts, “– Or a warrior!! Discipline will do the job!!! Lots of Granny’s discipline” Granny has a few words for the young “worm” who gave lip to Hoogin. Granny: You must learn to understand and love Hoogin, young one! He’s teaching you how to treat the lowest form of life! Hoogin: And that’s what you are!!! — worm!! Granny: All my new boys have that status!! But with time and patience, Hoogin will help to raise you a few notches!! You’ll become a rat! Then a wolf! And who can tell? — You may get to be one of Granny’s fine young tigers! Won’t that be a glorious day!! All praise to Darkseid!! Boot him on his way, Hoogin!!! Hoogin: You heard Granny, worm!! Follow your friends — and don’t stop!!! Granny: Good work, Hoogin!! You’re like a big, firm brother to my little charges! Of course, this isn’t the job you once enjoyed!! But I had to break you in rank when Scott Free made his escape to Earth!! Hoogin: I was the officer in charge of his unit! — I accepted the responsibility for his escape!! Granny: For reasons of my own, I’ve been trying to recapture him, Hoogin! And I’ve got a hunch that Scott will volunteer — to come back!! Hoogin: I can’t wait — Granny! Section Zero!! In the grim world of the Granny Goodness orphanage, these words alone conjure up the deep, underlying fear and secrecy that shroud a function of Granny’s operation which is never talked about! Those who vanish into Section Zero are never seen again!! But their cries are heard! — And what is done to their bodies — is hidden by seething gases!! — Unidentified vapor rising from deep pits — crossing spiny catwalks — assaulting the senses of Scott Free — Mister Miracle! Granny: Clever mechanisms are scarcely adequate against clever enemies, dear boy! — As you must have learned from Scott Free! Kanto: I heard about your unfortunate encounter, Virman! Virman: I was dropped into a deep pit!! But Virman Vundabar, with proper tools, was out of there in record time, Granny! Granny: Marvelous! Aren’t my boys marvelous! — And you, Kanto! — Are you too left undaunted by humiliation? Scott Free was at your mercy — yet, you too failed to kill him! Kanto: I never fail, Granny! In his case — I merely decided not to succeed! I knew Scott was headed here! — To this!! Granny: Bully for you! All right, you technical wonders in that room! Get this show on the road!!! Kanto: Your technicians seem ready, Granny! Whatever they’ve been doing appears to have been completed! Granny: Fumble-fingered sloths! Deadheads! Lower the energy screen!! Kanto: Of course! 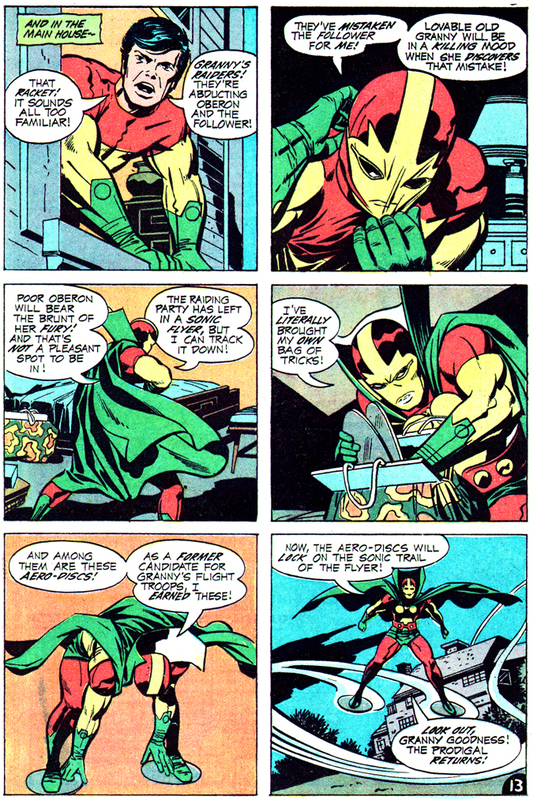 If Mister Miracle can function in that strange realm — so can his antigrav gimmicks! Granny: Do I detect a note of professional admiration, Kanto? Granny: You’re an assassin, Kanto! You kill on order! For reward! Kanto: — For Darkseid, dear lady! Because I’m very good at my trade! Granny: I dare say! If the fates decree it, I suppose your talents could be utilized against poor Granny herself! Kanto: It would fill me with infinite sadness, sweet Granny!! — Still, I should be discreetly silent, — respectful — thorough! Granny: You charming swine!! On such a day, beware! The pupil shall face — his teacher!! Granny: Y-you’re – mad! Defy me — and – you – defy — Darkseid! 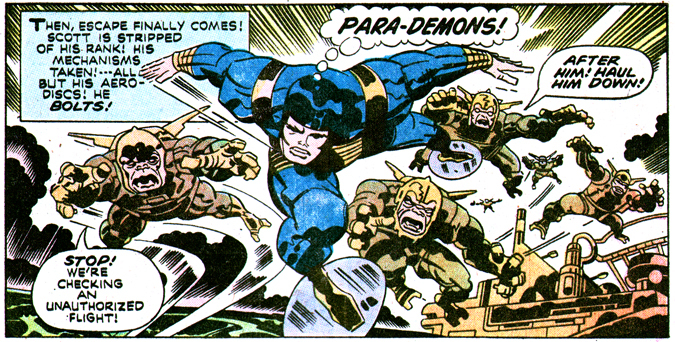 Barda: I’m doing it! With Scott dead — I’m going to destroy everything that killed him!! Barda: Hag!! You taught me how to hate! But you couldn’t teach me whom to hate!! In the nick of time, Granny is spared with the live appearance of Scott Free. Granny: What else, boys!? Tell Granny the rest!! First cadet: The Punishment Block is the throne of truth! Second cadet: Scott Free must be freed of lies!! Third cadet: I’LL take your darling demon-dogs, Granny! Granny: Be careful, dear boy! Their teeth have been newly filed!! Report, Scott! Scott Free: I was derelict in duty and a traitor to the tradition! When I was given living specimens for my lesson in prisoner interrogation, I allowed them to overcome me and escape!! Scott Free: B-but they look like us! They’re weaponless!! They cry under torment! Granny: And that’s the truth of it!! All of my words on this Chest Recorder have gone unabsorbed! Unabsorbed!! Scott Free: No, Granny! Don’t take my Recorder! I love your voice!! It gives me comfort!! Granny: [ripping the Chest Recorder off of Scott] You’ve denied me! You’ve rejected Granny!! Granny: Hail, great Darkseid! See what I hold!! See what so gently nudged through the dimension threshold — from New Genesis!! Darkseid: Izaya’s whelp, eh? This will hurt him!! He’s surrendered his prize lamb — for a tiger!! A young, sleeping boy is in Granny’s arms. Granny: He’s been given some mild sedative, I think!! There is a serene and fragile quality to his features!! Darkseid: He may conveniently decide to escape from Apokolips, Granny! Of course, on that day — the Pact I agreed to — will be broken!! Scott Free: Granny Goodness!! You armored old war-wagon! Granny: You’ll regret those unkind words. Granny will punish you for that! Minions: Let us handle him, Granny! Suddenly a gravitation pull is overwhelming our hero. Scott Free: W-what’s happening? I’m growing heavy — heavy! Granny: Stand back, my soldier boys. An invisible mass gravity beam has locked onto him! Granny has arranged a proper reception for her defiant enemy! You should’ve been more polite to Granny! Scott Free: Blast you, you mean old hag! Why don’t you kill me and get this over with? Granny: You shall die, dear boy — but only when Granny decides to give the order! Kanto: Rewards will buy my loyalty, Granny — but my code of conduct is my own! Granny: Blast your assassin’s code of honor, Kanto! Just remember that this prize belongs to Granny! [To Scott] Does that please you, dear boy? Scott Free: It’s as pleasing as falling in a snake pit! Virman Vundabar: Insolent swine! Let me finish him, Granny! Your own Virman shall still his tongue! Granny: [to Virman] Shut up! Virman: [wielding a pistol] No! No! This pig has escaped me once too often! Granny: Put that thing down! Pompous little egotist! Granny give the orders here! You’ll do as I say! Virman: Y-yes, Granny! Your authority remains unchallenged! Kanto: Hah! I’m paid to obey that old monster, Virman — but you shake whenever she barks! Virman: For all your boasting, Kanto — I’ve yet to see you defy her! Suddenly, chaos breaks loose among the evil-doers!! Minion: Stop him! He attacks without mercy! Granny: Who dares spoil this moment of triumph!? Orion: Stay where you are! — Or feel the wrath of Orion! Doctor Bedlam: If you came to save Scott Free and his friends — you’re too late! Virman: Think well before you attack us! — We represent the hierarchy of Apokolips! 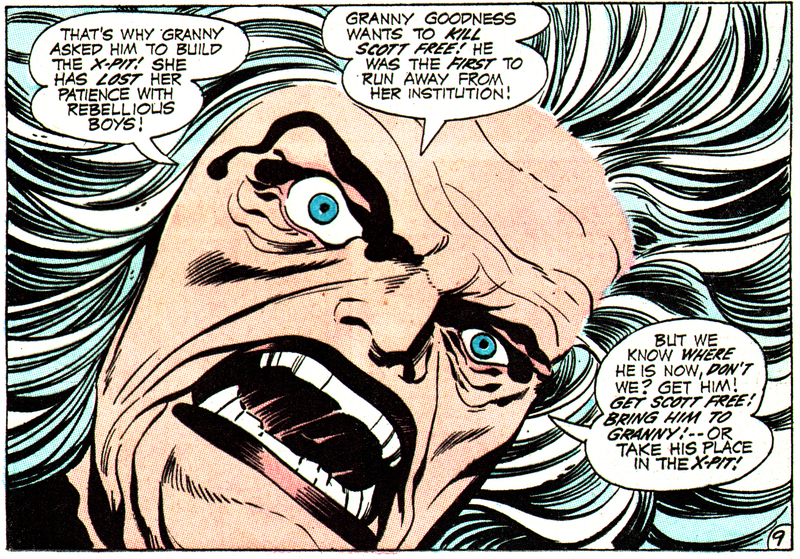 Granny: Injure us — and draw the wrath of all Apokolips! Posted 30 December 2010 in Apokolips, Day Entries, Mister Miracle #2, Villains, Weapons & Devices. Like a high-tech ticker-tape we see Overlord’s communication with its mistress when the “X-Pit” adventure begins. “–I–AM– OVERLORD — I–CREATE–I DESTROY — NOW — I — DESTROY–! — SCOTT–FREE–DIES! OVERLORD–IN–READINESS–TO KILL! CLOSING-ON-VICTIM — ADJUSTING–SIGHTS RANGE–OF–FIRE–UNLIMITED — OVERLORD AWAITS COMMAND!!! –” Overlord looks mighty big on page four of Mister Miracle #2 after tracking Scott Free as the super escape artist assembles a follower with assistant Oberon. 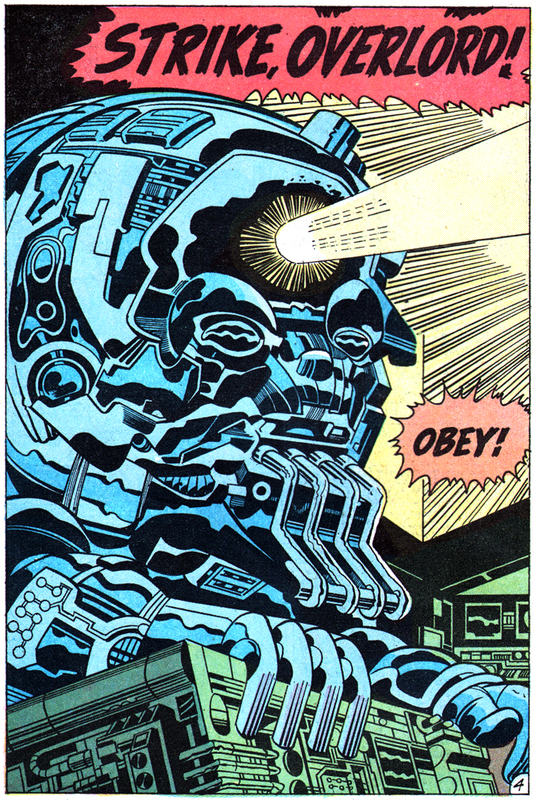 Thank Highfather the bizarre robot-looking device mistakenly targets the Follower in place of the real Mister Miracle (after receiving orders to “Strike, Overlord! Obey!”) and that “stand-in” takes the brunt of a destructive ray shooting from Overlord’s forehead. Scott and Oberon survive the “Explosion! Shock! Flame!” and his Mother Box takes a beating in the attack, prompting Scott to pour out his love and belief to revive the beloved protective device. It’s interesting to view the life and death of Overlord as a deadly competition with Mother Box — “her power race with vengeance” — revenge for being almost fried at the beginning of this story. Curious, too, how Overlord resembles an infant robot — giant head and all… this is Granny’s baby? Or is Overlord to grow…? A particularly creepy and effective villain, I say! Posted 29 December 2010 in Day Entries, Earth, Mister Miracle #2, Weapons & Devices. But later, as Oberon is sweeping up the debris, the Follower suddenly rises. “Yipe! Preserve me! It’s that weird, crawly ‘Follower’ thing! I-it’s come to life — trying to rise –” And, yet again, Apokolips agents believe the Follower to be the real Scott Free and they seize it and Oberon to deliver to the matron of Happiness Home of lovely Apokolips, Granny Goodness herself. But the witch immediately recognizes the fakery. “What!” the harpy screams. “You mindless fools! What have you returned with!!?? Didn’t you notice the dead eyes? This is a ‘Follower!’ not Scott Free!” The last we see of this particular model, it is being thrown across the room by mean ol’ Granny. Thus a dead super-hero is given new life, now inhabiting a Follower, one created by the Super-Kids of New Genesis… Leave it to Kirby!